I have always been an active person, but I could feel myself slowing down drastically. 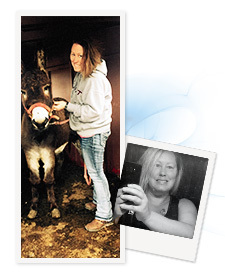 My ability to do my daily chores, running an Equine Rescue, was declining. The excess weight was taking a toll on me. My energy level was no longer what it used to be and it took me longer to get things done. When my knees began to hurt, I knew it was time for a change. I needed to feel better, not only for myself, but for my family and the hundreds of animals who depend on me daily. After meeting with my surgeon for the initial information session, I did a TON of research. With my history of acid reflux, I knew that the gastric bypass was the way for me to go. Every part of my experience was of the highest of quality. Every aspect of the program, including the insurance coordinators, nurses, nutritionists, respiratory therapists and receptionist was staffed with professional and friendly people. I joined the Barix Facebook support group immediately and it has been immensely helpful with figuring out the small things. I have had excellent, timely and well explained follow-up appointments since surgery with both my surgeon and the internist. The staff is always willing to answer questions when I call to confirm things or just have a silly question. I am back to myself, the person I was about 9 years ago. I am energetic and outwork the youngsters around the farm. I can keep up with my crazy lifestyle without fatigue and my knees, they feel amazing. This has been the best decision I have made in a long time, the transition was not nearly as hard as I expected it to be. I have fallen into the new eating habits with such ease. Don't wait, make that initial appointment. Do it for yourself and your family. It is worth all the effort and change. The sky is the limit with your health and the new you.